Political regimes can be classified in a number of ways. One important distinction is that which divides democracies from the other things. Quite apart from democracy's appeal as an end in itself, the evidence suggests that democracies engage less in oppression, human rights abuses, and internal and external uses of political violence. If one opposed those things, one might support democracy over other systems for instrumental reasons, even if one didn't hold that it was necessarily better at producing more effective policies. There are many theories about what causes countries to transition between democratic and non-democratic forms of government. Wikipedia lists 14 factors advanced as possible promoters of democratisation, including wealth, education, culture, social equality and so on. There are also the 'grand narrative' stories about political transition, such as Marxism or Fukuyama-style neoconservatism, in which the adoption of one system or another is seen as the result of a semi-predictable sequence of developments. The proven difficulty of political forecasting, and the failure of one-size-fits-all theories to anticipate political crises, suggests that regime transition might be driven instead by numerous, possibly unobservable factors that jointly make it impossible to foresee political transitions in anything other than the very short term. What if, instead of trying - perhaps fruitlessly - to develop complex models of political transition, we use something very simple which relies on no attempt to understand the underlying mechanics and looks instead only at observed frequencies of transition? What would this 'total ignorance' approach tell us? The sizes of the boxes are not scaled to the average numbers of countries within them, and the percentages refer to the frequencies of countries in the box of origin: so on average 3% of military dictatorships become civilian dictatorships the following year, while 1% of democracies become military dictatorships, and so on. Figures are to the nearest percentage point, and so transition frequencies of less than 0.5% are not shown to avoid clutter. Purely as descriptive statistics, the figures do tell an interesting and convincing story. For whatever reasons, democracies and royal dictatorships have been the most stable systems. Civilian and miltiary dictatorships change state more frequently. 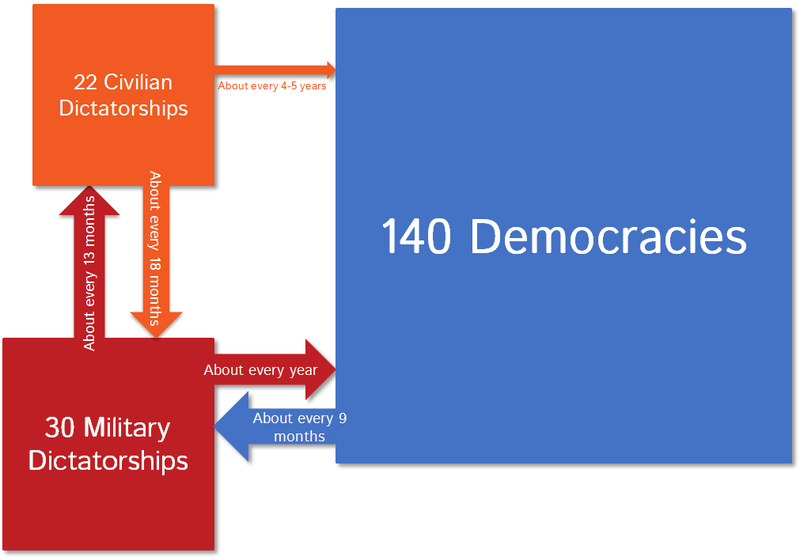 A military dictatorship is around four times more likely to transition to democracy than is a civilian one. 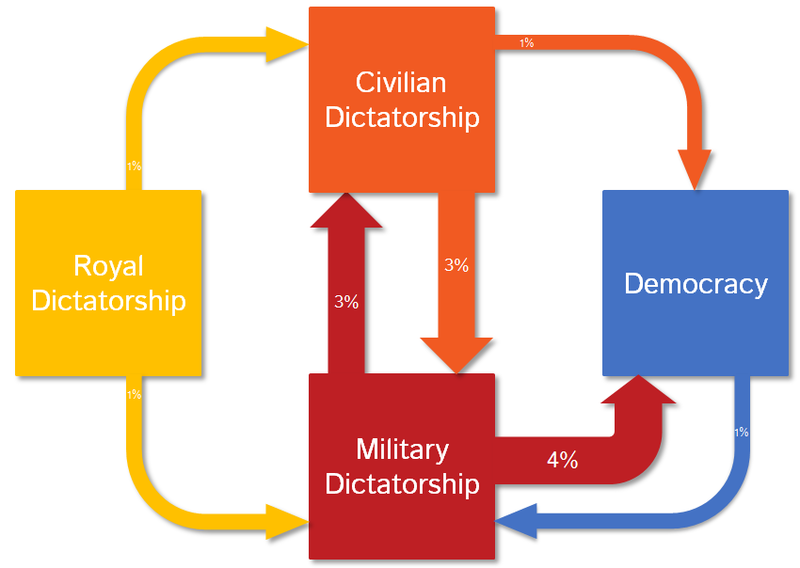 The route out of democracy is generally into military dictatorship (there is only one example of transition from democracy to royal dictatorship in the database - Nepal in 2002 - so this path is not shown on the diagram above). And the royal dictatorship's days seem to be numbered: while dethronements occur occasionally, the creation of new royal dynasties does not. The royal dictatorships have disappeared. The relative stability of democracy means that around three-quarters of countries are in that box. But it's not the end of history, thanks to their occasional tendency to lapse into military dictatorships. In this hypothetical future world, a military coup takes place in a democracy about once every 9 months. Because it's a steady state, dictatorships go the other way at the same rate. If - and it's a big 'if' - the assumptions required to build this model were right, how close would we be to steady state today? The data only go as far as 2008, unfortunately, but at that time there were 118 democracies, 38 military dictatorships, 24 civilian dictatorships and 12 royal dictatorships. Not far off, in other words, although this is less surprising given that the model is built using observed transitions. The certainty does seem to be that the royal dictatorship has had its day. The question for Bahrain, Brunei, Jordan, Kuwait, Morocco, Oman, Qatar, Saudi Arabia, Swaziland, Tonga, UAE and Samoa must be: "who's next?" And can they perform the historically-difficult transition straight to democracy (only Bhutan and Nepal seem to have managed this) or is an interim military or civilian dictatorship inevitable? Maybe democracies and royal dictatorships are to local entropy minima. So, are there other, as yet unseen, even lower energy states?